The villa, with own private descent to the sea, is built in an elegant and luxurious neoclassical style on four levels and is adorned by tens of archaeological objects of inestimable value. 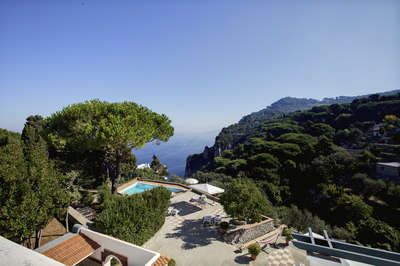 The property enjoys 270 degree sea views, while the west, east, and south sides are surrounded by a large, private garden (considered Italy's most impressive, private garden with more than 700 species of plants, flowers, and trees up to 60 feet high. A walk through the property, its garden, open spaces, and internal rooms is a truly emotional experience: elegance and classicism, all with a very strong relationship to local southern Italian traditions, can be found through the property's decor, paintings, and various artifacts. Marble columns and fragments complete its style, while it is difficult to verbalize what Villa Syrene truly represents. Guests will surely be overwhelmed by its history, as well as its gardens, style, detail, and stunning sea views. At the end of your first trek and journey you will surely be filled with the desire to begin your tour all over again. The entrance to the neo-classical residence is very soft. A private driveway leads through the garden right down to the entrance door. The elegant hall, lined entirely in marble and white columns, is adorned with important marble fragments and Roman statues. This hall offers a half bath. Access into an elegant lounge facing the sea has three French doors, which lead out onto a terrace. The lounge has tiled floors, comfortable sofas and glass topped table, with capitals from Roman villas; television and DVD player; antique statues and sculptures, wall paintings, as well as special lighting, adds to the elegance and intimacy of the property. Access from the lounge is into Study and French doors leading out onto a terrace. The terrace offers incredible views out over the Gulf of Naples with the majestic volcano, Mount Vesuvious, lying directly in front of you, on the opposite side of the Sea. Views are truly spectacular on days when the sun plays with the colours of the deep blue sea as the sky lines the top of the volcano. The marble floored terrace, adorned with beautiful potted cactus plants, has a glass-topped table with the capital Roman columns as a base. One table seats eight people and the other two tables each seat six to eight people. In case of an event or important dinner, the terrace can be arranged to accommodate up to 50 people). The terrace also features an electronic canvas to balance the heat and shade. Along the other area of the first floor of the villa lies the kitchen and dining rooms. The spectacular and large kitchen is divided into two areas and with vaulted ceilings, is tiled entirely with black and white tiles. It features a large semi-round cooking station with six stove tops and a sink. The kitchen has several facilities, which allow for preparation of everything from snacks and light meals to full meals or gala dinners. It features a double sink, double ovens, large refrigerator with freezer, ice cream and sorbet maker, toaster, microwave oven and meat-slicer. A small marble table with four chairs serves as a spot to drink a morning cup of coffee. The kitchen leads to a terrace, which is an extension of the main kitchen, as it offers external cooking and dining facilities including a brick oven (ideal for pizzas, homemade bread and meats). The dining area consists of two, separate dining rooms. Both are elegant and portray the style found throughout, antique furniture and marble columns. The informal dining room leads directly into the kitchen, on one side, and to the external dining terrace, on the other. The seven bedrooms are located on the first, second, and third floors, all up a large, majestic marble staircase decorated with lovely period paintings. Large windows face both the garden and the sea from the floors above. The first floor, up 23 steps from the main entrance hall. It boasts one master bedroom with French windows with sea views overlooking the gulf, a spacious bathroom in precious marble decorated with large mirrors. There is also a living room with three French doors which lead out onto a lovely balcony facing the sea. The second bedroom boasts parquet floor, a double bed, a wooden closet and two French windows facing the garden. Large, marble bathroom with double sink and French windows. Up 23 steps from the main entrance hall. Four double bedrooms are all located along a corridor. All bedrooms have en suite marble bathrooms. 23 steps lead up to an unfurnished panoramic roof top terrace where you can enjoy wonderful views of Sorrento and a wonderful Gulf of Naples. The basement is reached by an external staircase of 21 steps off the main terrace. This floor enjoys one large relax lounge equipped with glass-covered portico, just perfect for summer barbecues. This area also serves as a passage way to the direct sea access. Garden service (8 AM to 12 PM and 12:30 PM to 4:30 PM). Housekeeping service (Monday to Saturday, 8:30 AM to 2:30 and four hours on Sunday morning). Cook service (food and beverages are not included). Breakfast service (Monday to Saturday, 8:30 AM to 10 AM and Sunday, 9 AM to 10:30 PM). Lunch service (1 PM to 2:30 PM daily). Dinner service (8 PM to 10:30 PM daily). Maid service (five hours daily). Porter service (upon arrival and departure only). Linen and towel change (every three days). 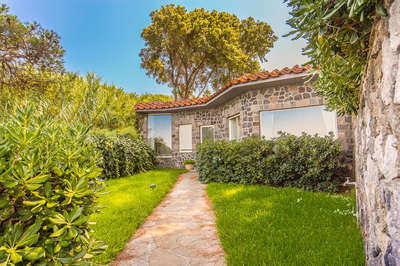 The Sorrentino coast welcomes you with sites of extraordinary natural beauty and fantastic views of Mount Vesuvius and the Gulf of Naples, in an area that stretches from Castellammare di Stabia to Sant’Agata dei Due Golfi. Sorrento, the most relevant city of the area, is a favorite destination for many, thanks to a magic combination of quaint narrow streets, baroque churches, mild climate, verdant gardens and excellent hospitality.